What are root vegetables and how do you use them in your weekly meals? First things first, I’ve compiled my Best Root Vegetables for you and your family. Let’s identify what root vegetables are. Fall is the season root vegetables are available and abundant at the farmer’s markets. Their sizes vary from tiny round radishes to large knobby celery roots. Root vegetables are plant roots used as vegetables. Here “root” means any underground part of a plant. Wikipedia Grown in the soil, many carry high nutrient levels. Rich in nutrients, the carrot which shouldn’t surprise you has the highest amount, the leek, and potato follow. Protein can also be found in some root vegetables but their levels are quite small; such as the beet- 15%, potato-11%, sweet potato 6% and yam at 8%. As you can see from the chart there are thousands of types of root vegetables and varieties around the world. We may never know the exact number. Read more Here. Also, to listen to the my podcast from the Live Radio Show. So what are these unknown vegetables and how do we use them in the kitchen? Let me list some of the most common vegetables for you, so you can get started. Beets : they can be eaten or roasted, with an earthy sweet flavor. Celery root: Once peeled, underneath is a creamy white flesh often tasting sweet like the stalks. Can be shaved for salads, or cooked in stews. Radishes: Can be eaten straight from the garden with a sweet, crisp texture with a zesty juice. Jicama: peeled with a crunchy texture. Added raw to salads or use as a chip for dips. Rutabagas: Milder , sweet and creamier than turnips , use in the same dishes as the parsnip. Fennel bulb: can be eaten raw,shaved in salads, and often called “sweet anise”, a licorice taste. When cooked it becomes sweeter. Roasting: Vegetables are cut into pieces, placed on a sheet pan with a drizzle of olive oil and salt and pepper. Oven pre-heated at 400 degrees for 35-45 mintues. Baking: Whole vegetables can be baked in the oven at 350 degrees until tender. Grilled: Vegetables can be placed in a well-oiled basket, with salt and pepper and spices and turned occasionally until tender. Boiled: In a large pot vegetables can be boil, but not quite the flavor as the above methods. My beginning 5 categories to get you started cooking with roots. I have gathered recipes from other sources, as well as my site. Just starting with these recipes can give you a head-start in a more healthful diet for your family. And remember just having fun in the kitchen with your kids is what counts! Simple with refreshing flavors comes this creamy sauce with a bit of a tang! Use it to top your rooted vegetables or just as a dip! Place the salt on a chopping board and finely chop the garlic clove on top of the salt. Place the yogurt in a medium size bowl and whisk until smooth. Add the garlic and salt, radishes, and the dill. © 2012 – 2014, Mary Papoulias-Platis. All rights reserved. YES! 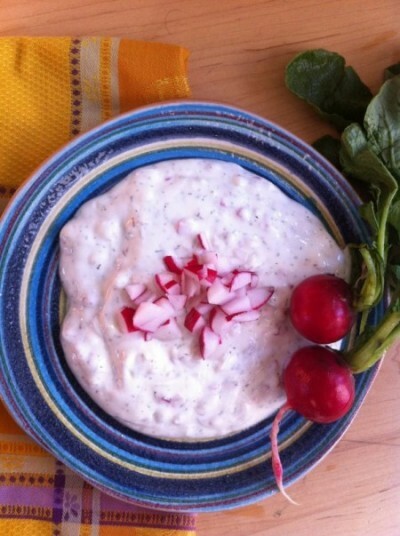 I love radishes and I love yogurt. I have never thought to put them together before. I think that would be great with a cucumber puree and layered in a small glass dish.